Providing operated cherry picker hire for tree surgeons, MC Property Maintenance has many years of industry experience. Our skilled cherry picker operators can provide quick and easy access to trees for tree surgeons working across Sussex, Surrey, and the South East. Working on residential, commercial, and industrial projects, we have the cherry pickers for a full range of spaces and sizes to ensure that we can carry out your project safely and in good time. 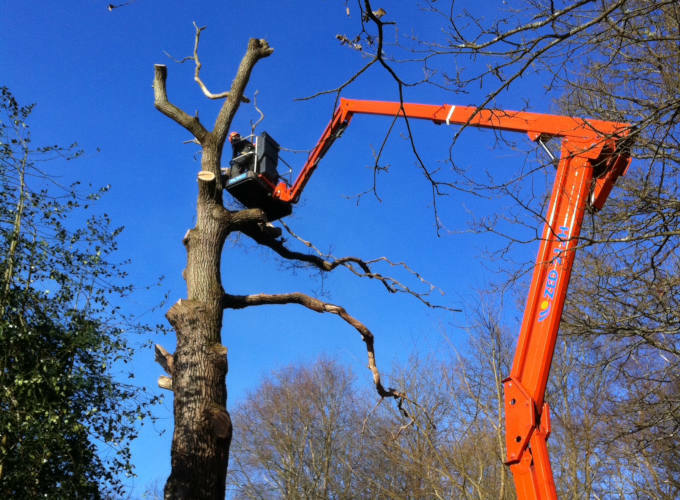 So, whether your project requires a tree surgeon gaining access to an awkward or tight space, or you need to reach to the top of very tall trees – we can help. Please get in contact with us today for more information. Whether you need to have a tree trimmed in your garden, or branches are beginning to interfere with your industrial or commercial property, sometimes a high access tree surgeon is the only option. MC Property Maintenance can provide you with high access services to be able to deal with trees of all heights. We can provide you with fully trained and highly skilled operators of cherry pickers as a part of your operated hire. Our team has extensive experience working alongside tree surgeons and understand what is necessary in order to get someone to the right place to safely cut trees in a time-efficient manner. As cherry picker operating professionals, our team work to the highest standards, ensuring full health and safety requirements are adhered to at all times – even on the highest and most awkward of projects. There is a wide range of different platform options available so we will certainly have something to suit your needs. MC Property Maintenance is based in the South East of England, and we carry out works across Sussex, Surrey, London, and beyond. Don’t hesitate to contact us if you have a project around this area, we often carry out works across a broader region. Would you like to learn more about our operated cherry picker hire for tree surgery? The team at MC Property Maintenance have years of experience working in high access and would be happy to provide you with any information or details about the services that we can provide. Please get in touch with our team by calling us on 01243 530 076 or send us a message using the contact form. We will get back to you as soon as possible.